Charles Willeford was an offbeat noir/crime writer whose oeuvre I've been hoping to dive deeper into for years; it's probably been about 20 since I read his "The Burnt Orange Heresy" (1971), which has got to be one of the funniest, most absurd "crime" novels ever written. I also tackled his 50s pure-noir "High Priest of California" and "Wild Wives" hardboilers around that time, and remember them to this day as being quite pleasingly vicious and raw. 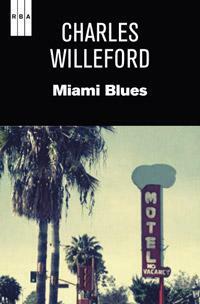 To the extent that Willeford is known outside (or even inside) the crime enthusiast world, it's for a series he wrote in the 1980s just before his 1988 death featuring a derelict detective named Hoke Moseley, the most famous of which is the first one, "MIAMI BLUES", which was made into a film some time after that and which I just finished reading this past weekend. I have no hesitation in the slightest pronouncing it as having delivered. Willeford is no Jim Thompson nor Elmore Leonard; both his gumshoes and his criminals are pretty bent, odd characters, and his writing zags off into strange tangents that are ridiculously funny and somehow still an integral if bizarre part of the larger story. 42-year-old detective Hoke Mosely's premature dentures, for instance, get into all sorts of conundrums in this tale, and the story also has some pretty offbeat digressions into the nature of Japanese haiku and all manner of health foods. I obviously haven't read the other three Hoke Moseley novels, but I enjoyed greatly how his personal and find-the-bad-guy story was told only in alternating chapters, and in an only slightly linear fashion as well. The other alternating chapters are given over to psychopath Freddie "Junior" Frenger and his doofus "platonic wife" Susan Waggoner, whom Freddie meets when she shows up upon his arrival in his Miami hotel room as a prostitute. Freddie has just gotten out of prison in California, see, and his chief aim is to do something big that even he knows will land him in prison again - he's just not sure what. He's a vicious bodybuilding thug whom we only learn about in spurts; most of his action is in real time, as he breaks fingers (sending a Hare Krishna into death by shock), robs people blind, breaks jaws and emotionally & physically abuses Susan. Frenger is on a collision course with Moseley, and even he seems to know it. He decides that his "big splash" is going to be a coin dealer in downtown Miami, and let's just say things don't really go as planned, as crimes planned by psychopathic, prison-lifer muscle-thugs often don't. Willeford seems to be simultaneously laughing and pointing fingers at the crime genre and spinning a ripping crime yarn at the same time. It's what endeared me so much to "The Burnt Orange Heresy", and much of his same sardonic art is alive and well in this one.